As my contribution to the continuing campaign against the Higher Strength Beer Duty, I’m selflessly drinking through my collection of beers which are directly affected by this absurd tax. I’ll spare you the rant (you can visit my inaugural post on the matter if you want to know more) and move straight onto tonight’s guest beer. Brewdog has been on my ‘must do a Tour-At-Home thingie on these guys’ list for a long time, and I even have a box of some of their range sat next to me waiting to be drunk. However, not much in that box qualifies for my HSBD theme, so I’ve had to raid my ‘Monster’ shelf instead. They’re certainly no strangers to strong beer; they’ve been flying the Union Flag in the contest for the World’s Strongest Beer title for some time now, with insanities like Tactical Nuclear Penguin (which, to be honest I desperately want to try just because it’s such an awesome name) and Sink The Bismark – the current leader (if you ignore the not-really-available The End Of History) at a terrifying 41%. 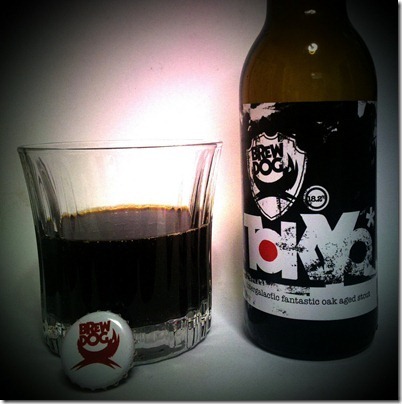 Slightly more accessible, but still at a mindblowing 18.2% ABV, is Tokyo* – subtitled as an “intergalactic fantastic oak aged stout”. Having managed to miss International Stout Day by a day, it only seems right to dig this one out of the cupboard. Pouring into the glass, it’s an unremarkable looking drink; without much of a head to speak of it looks more like a coke than a beer. The aroma, however is huge and powerful from the moment you open the bottle; that rich smell of overripe oranges, sweet black treacle underneath with a surprisingly understated alcohol bite. I can also find hints of liquorice, and something strong and sweet that I can only really describe as “port-like”. This is a hard drink to sum up. Is it even a beer? Well technically maybe, but it doesn’t smell or taste like one. Was it brewed as a high strength gimmick? Possibly, Brewdog do love to make a point with their beers. But I’m not sure it matters – you don’t open a bottle labelled 18.2% ABV expecting a regular beer. What you get, other than an absurdly strong drink, is a damn tasty glass of semi-spirit to take your time over and savour. This is not an every day beer. This is not even an every week beer. But it is every inch a monster beer. As you say, though, not a school night drink. Ooh, I’m jealous of the penguin. I’ve wanted to try a bottle of that just because it’s such a fantastic name!